Well then that does it.. I’m NEVER getting pregnant!!! Yeah. You definitely have to put things in perspective. 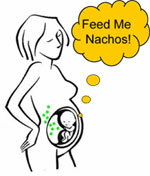 Have a kid, or spend 9 months craving nachos knowing it’s not safe to eat them! Next Next post: Nacho Cheese as a Scare Tactic?